I've noticed that we as women tend to let "stuff" get in our way of what we are supposed to be doing. I was reading a blog by a non-mormon girl that was talking directly about Mommy Mormon Bloggers, and the "Perfect" image they portray. She said they were fascinating because she'd never known anyone like that. She said she found herself wondering what was so wrong with her that she couldn't manage her life as well. The truth is that we as Mormon Women Bloggers need to show the truth. We need to show how crazy, hectic, unmanageable, disorderly, and crazy our lives are. We need to do as Joan of Arc once stated when it comes to allowing the world to see our imperfection. 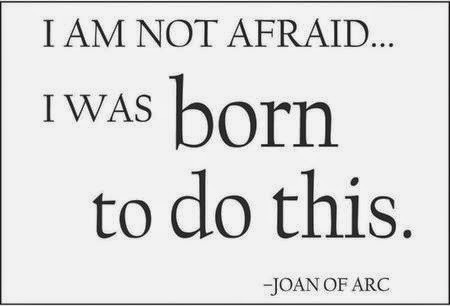 It can be scary, but be not afraid, for your were "Born to do this." I recently moved to a new home. I have loved getting it put together, pictures hung on the wall, letting my crafty side come out, decorating my mantle, and on and on. That's fun, as it should be. If you leave my front room though you'll see that I'm a wreck. My jewelry desk that I sit at 35% of the day is covered with random stuff, and completely unorganized. Go to the next room and you'll see the kitchen counter covered in dirty dishes, along with the sink packed. I have mountains of laundry sitting outside my bathroom, and heaven forbid I have yet to dust. The blinds are always open though, it's always bright and sunny, and you'll always get a nice cold Pepsi (sorry, no Diet Coke here) when you walk in and sit down. I might even feed you. I'm not saying I'm perfect. My crazy house makes me just that, crazy. I can't let it control my life. I'm not going to just not open the door if my front room is a mess. I figure if it bothers the person then that's on them, but I'm going to choose to focus on them and give them my love an attention. This isn't to say that I don't love the pictures of the perfect looking children, or the beautiful houses decorated with the most in style trends. They're fun to look at, and it's great that people are able to have nice things in their homes. I choose to not let it get me down though. I like to focus on the amazing relationship I have with my husband. Sure, we're not taking family trips to Hawaii or building a new home, but we have a really comfortable bed where we snuggle every night to watch our movies together. I'll take that for right now. So dear blogger where ever you may be feeling pretty down about your life. I want you to know that that every Mormon blogger out there isn't perfect. We all don't own a fashion blog, or have our kids pictures taken professionally every week, or have homes that look like they came out of a magazine. We have heartache and pain, trials, and hard times. We have pitfalls, and screw ups, and we even put our foot in our mouth on occasion (just ask my sister's and mother in law). We live real lives just like you do, so don't feel alone. Because being a member of the church doesn't make us immune to real life. I like to think it makes us more real. That's who we should be striving to be anyway. Aren't Mormons supposed to abstain from caffeinated drinks (Pepsi)? I don't have a problem with drinking Pepsi, but was just wondering. Btw. good point you made in this blog entry. Aren't Mormons supposed to abstain from caffeinated drinks (Pepsi)? I don't have a problem with drinking Pepsi, was just wondering. Btw. good point you made in this blog entry. @jackietjan1 That's actually a misconception outside of the church. We're encouraged to stay away from coffee, and tea, but caffeine is a personal choice. My brothers choose not to drink caffeine, where I live on Pepsi :) Thanks for reading my blog and have a wonderful Sunday!